Safavid Rugs – The Timurid dynasty did not far outlive the fifteenth century. In the west it had already lost power to Turkoman dynasties in Mesopotamia and Northwest Persia. But these were swept away by Shah Ismail about 1501 who, supported by nomadic Turkoman troops, established a new “Safavid” dynasty all across Iran which lasted until the early eighteenth century. Safavid rug weaving was above all a sophisticated urban phenomenon, reflecting the cutting edge of Islamic artistic design more generally. Safavid rugs relied overwhelmingly on the sinuous patterns or arabesques developed initially in manuscript illumination and architectural décor, developing a unique antique rug style. And although allover designs were not rare, Persian rugs of the Safavid period tended to use the large central medallion format developed in the last phase of Timurid rug production. One could reasonably argue that the medallion format and arabesque detail in rug weaving attained new heights of perfection under the Safavids. This went hand in hand with the development of increasingly fine techniques of weaving that facilitated the rendering of intricate, curvinlinear detail. Scholars have tended to attribute the centers of Safavid weaving to the major cities or centers of power. Tabriz, Ismail’s initial capital, was certainly one such center. The later capital of Isfahan has also been accorded status as a center of production, with many outstanding seveteenth-century Safvaid carpets attributed to it, although there is no hard documentation for this. Safavid carpets were woven in Kashan. Kerman was a also major center of production for the well-known “vase-carpets” of the seventeenth century. While carpets must have been made in many areas of Safavid Iran, it is still surprisingly difficult to make specific geographic attributions for Persian rugs of this period. 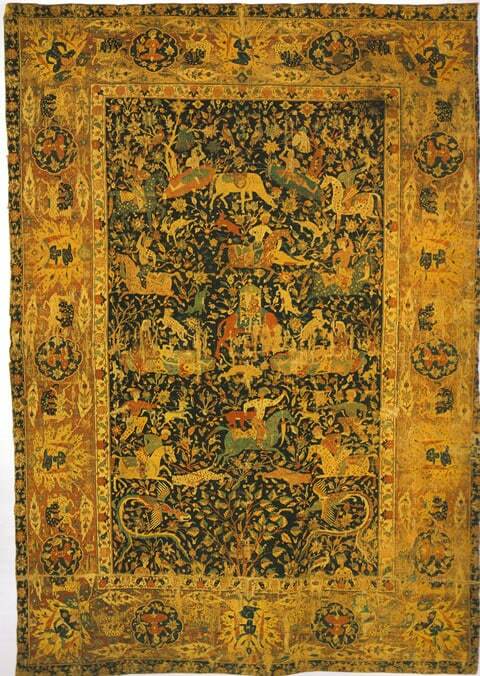 Polonaise Carpet, Iran, 17th century, ex. Coll. King Umberto of Italy, (from V. Berinstain et al.,Great Carpets of the World, fig. 152). The Safavid dynasty produced an abundance of local arts during the 16th century. Classic Persian carpet weaving flourished in this period (from 1499 to 1722). Shah Tahmasp (1524-76) promoted the arts and was a painter, as well as a carpet designer. Under his tutelage decorative arts evolved. Shah Abbas the Great (1587-1629) continued this legacy. Design changed from curvilinear to rectilinear and new designs emerged. Intricate patterns were drawn on cartoons which the artists implemented into their weaving. 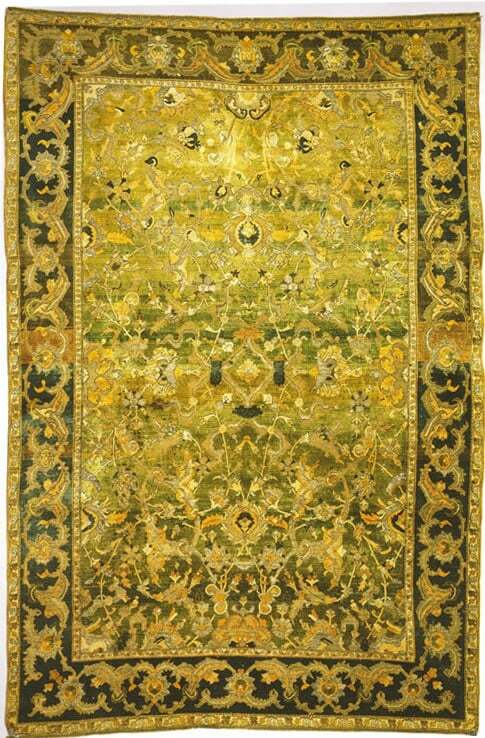 There are only 2500 to 3000 carpets and fragments that have survived from the Golden Age of the Safavid dynasty. The most famous is the Aradil Mosque carpet dated 1539, which is on display at the Victoria and Albert Museum in London. The four most important rug weaving centers were located in central Persia, Tabriz, Kerman, and eastern Persia. Oriental Rugs from central Persia were woven in Kashan and Isfahan. Kashan is noted for its use of silk pile. Shah Abbas moved his capital to Isafahan in the late sixteenth century and set up a factory to produce silk and metal brocaded carpets. Tabriz, the first Sefavid capital was also an important weaving center. Tabriz was ultimately overrun by the Turks during the 16th Century and the seat of government was moved temporarily to Kazvin and eventually to Isfahan. The Antique oriental rug production also existed in Kerman, where vase carpets are assumed to have been woven. 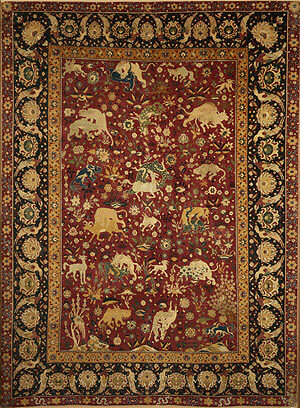 Eastern Persia also produced rugs during the Safavid period. As an example, Herat was a major city in eastern Persia and many rugs are known by this name.